Polar, the company synonymous with heart rate monitors, have now officially entered the hugely competitive fitness tracker space, debuting their A360 fitness band complete with, you guessed it, a heart rate monitor. In terms of functionality, the Polar activity tracker comes with everything you would expect and not a whole lot of what you wouldn’t expect. So in comes your typical step counter, distance tracker, calorie counter and the ubiquitous sleep tracker. You will also get alerted when you have been stationary for too long, such as if you’ve been sat still driving for too many miles without taking a break to wander around, or if you’ve been sat behind your desk all day without getting up. Finally, the device hooks into your smart phone – initially on iOS but also on Android by Mid November 2015 – meaning you’ll get the typical smart watch style alerts, such as messages, emails and calls. I’d like to start this review on a more positive note. Simply because sadly we’re a little thin on the ground when it comes to the positives. My favourite aspect of the A360 is its thorough waterproof-ness. Unlike other splash proof devices, you don’t have to take this one off every time you get in the shower. With 30 metre water resistance, you can go properly swimming with it. This allies nicely with the no strap heart rate monitor – which strangely marks Polar’s debut in this space. For a company whose history and pedigree lies in heart rate monitoring, its curious that they have taken so long to match Garmin and others in this regard. They had a cordless strap in market as long as the 80’s but were slow to adopt the LED powered capillary monitoring. The introduction of this with their debut activity tracker is frankly a bare requirement to compete in this space, but a welcome feature nevertheless. This is all well and good, but sadly this Polar tracker has some pretty serious downsides. Firstly, and its important to keep it in context, this device comes in at a punch price point. At £130/$200, its batting in a bigger league than many of its direct rivals, notably Fitbit and Jawbone. Frankly the comparable Up3 from Jawbone and the Charge HR from Fitbit are finer products at a better price. The finish-quality of the Polar A360 just isn’t up to par – its plastic finish is seriously underwhelming, feeling brittle and cheap. 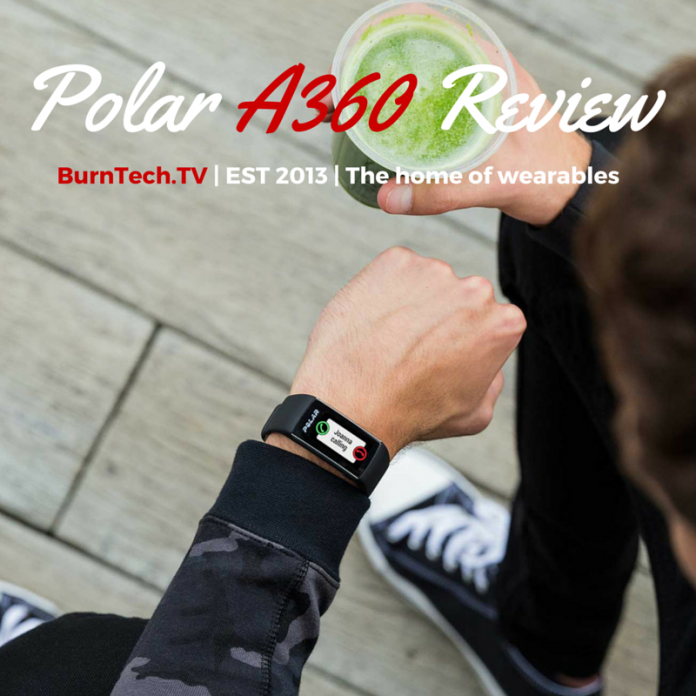 Its feature set is also light – which is slightly surprising considering Polar’s background in fitness tech focussed around the needs of runners. Therefore, the absence of GPS tracker, and therefore this devices inability to track distance and pace is all the more surprising. This is a basic smart watch feature, and one which you’d expect a fitness band costing £130 to provide. Its worth dialling in some more on this bands design – as these devices are increasingly as much a fashion accessory as they are a fitness gadget. As is the vogue style, bright colour comes as standard for the the A360. Coming in three different sizes – small, medium and large – the device features an elongated multi-colour touchscreen but also a disappointingly non-ergonomic design. The lack of curve on the screen definitely hinders its comfort and fit, and contributes to the overall cheaper feeling. Polar’s debut fitness tracker hits the shelves in November, just in time for the Christmas fitness gadget gold rush. Availability will initially be limited to black, in sizes medium and large. Previous article13 Little-Known Reasons Why Women MUST Lift Weights!